Gun Lake, MI — (February 2, 2013) — The 2013 schedule for the Engine Pro Sprints on Dirt Presented by ARP has grown by two dates with an exciting addition to one date that has been already announced. The winged 360 sprint group is proud to announce a return to Butler Speedway. The only appearance of the season at the popular sprint car oval located in Quincy MI will be Saturday June 15th. To make the race date even more exciting it will be a co-sanctioned event with the NRA Sprint Invaders from Ohio. This will mark one of several co-sanctioned SOD-NRA shows on both sprint car sanctioning bodies’ 2013 schedule. The other addition to the schedule is a new event that hopefully will become a yearly tradition. The Fremont Speedway in Fremont Ohio has scheduled a triple sanctioned race on Saturday August 10. This can’t miss event will be sanctioned by the Engine Pro Sprints on Dirt, the NRA Sprint Invaders and the Fremont Speedway 305 sprint division. This will add up to an incredible car count and if that is not enough to get race fans excited, the feature will pay a generous $3,000 to win and $300 to start the main event. The Sprints on Dirt would like to thank promoter Rich Farmer for supporting sprint car racing and promoting this incredible show. The other upgrade on the 2013 Engine Pro Sprints on Dirt Presented by ARP schedule is the addition of a co-sanction with the NRA for the Saturday May 4 race at Mike Mouch’s I-96 Speedway. The exciting news that was announced recently that the sprints will be returning to the ½ mile Lake Odessa MI oval is now even more enhanced with the best 360 racers from Ohio, Indiana and Michigan competing. The purse structure for this event is still being developed and will be announced in the coming weeks. The Engine Pro Sprints on Dirt Presented by ARP will be sanctioning events in Ohio, Indiana, Michigan and Ontario during its 34th year of dirt track competition. For more information please check out www.sprintsondirt.com. Gun Lake, MI — (January 19, 2013) — The 2012 Engine Pro ASCS Sprints on Dirt Presented by ARP came to a conclusion Friday night with a crowd of nearly 100 celebrating the recently completed season. The Fountains banquet center in Parchment MI was the location for the celebration of Gregg Dalman’s first sprint car championship in 13 years of competition. The Bellevue MI racer thanked his hard working crew and car owner Jason Fausey for helping him reach this tremendous accomplishment. Marketing Director Scott Overlund of Engine Pro Grand Rapids was on hand to congratulate the top 11 point drivers and track promoters Ron Flinn of Crystal Motor Speedway and Steve Pavalowski of Tri City Motor Speedway was among the special guests at the celebration of the 33rd year of the Michigan based sprint series. Gun Lake, MI — (January 19, 2013) — The 34th season of exciting sprint car racing will begin at Crystal Motor Speedway on April 27 for the Engine Pro Sprints on Dirt Presented by ARP series. An incredible variety of events are on the calendar at speedways in Michigan, Indiana, Ohio and Ontario. A total of 19 races are currently on the schedule with four events yet to be announced. Highlights for the 2013 season include the return to Plymouth Speedway in Plymouth Indiana. This long time asphalt 3/8 mile oval has expanded the size of the newly constructed clay oval to a much larger ¼ mile track. The group will appear on two occasions May 18 for the Earl Gaerte Classic and August 17 for the inaugural Bob Newton Classic. The Hartford Motor Speedway always brings out the best racers in the Midwest and SOD will return on June 14 and August 16. The series will make its return to the I-96 Speedway in Lake Odessa MI and the even better news is the events will be held on the very popular ½ mile oval, these races are May 4 and August 3.The series will make return visits to Ohio tracks; Limaland Motorsports Park, Eldora Speedway, and Waynesfield Raceway Park twice, which includes the second annual Bob Reynolds Memorial race paying $7,000 to win and $600 to start on July 3 to support the NRA racing series. The series will compete at a total of 13 different race tracks during the 2013 championship chase. Long time supporting tracks of the Engine Pro Sprints on Dirt Presented by ARP returning for 2013 include Owendale Speedway and the Winston Speedway. Crystal Motor Speedway in Crystal MI hosts three events in 2013 and holds the honors of being the only track in the country to host an event every year in the 34 year history of the winged sprint series. To commemorate this great support, the series is excited to announce that the Engine Pro Mid-Season Championship a special event on Saturday July 20 will return with a 34th Sprints on Dirt Anniversary race. This event will pay $2,034 to win, $300 to start and have a special 34 lap length feature. The National Racing Alliance Series has agreed to co-sanction this event. The Tri City Motor Speedway located near Auburn, Michigan will host the group on three occasions in 2013 and the season championship for the series will be held on September 21. The Engine Pro Sprints on Dirt Presented by ARP will again support the Canadian Sprint Car Nationals at Oshweken Speedway September 13-14. The Engine Pro Sprints on Dirt presented by ARP series sanctions winged Sprint Car races at speedways throughout Michigan, Indiana, Ohio and the Canadian province of Ontario and will enjoy its 34th season of operation. The 2013 schedule can be viewed at www.sprintsondirt.com. Gun Lake, MI — (January 19, 2013) — After a seven year sanctioning agreement with the American Sprint Car Series the Engine Pro Sprints on Dirt had ended its affiliation with the Tulsa Oklahoma sanctioning body. The seven year run as a regional affiliate of the ASCS was of great help, but it was determined by SOD ownership that a change was necessary. “The Sprints on Dirt Series has great respect for Emmett Hahn and his staff with ASCS” stated John Naida owner of the Engine Pro Sprints on Dirt. “The assistance of ASCS has made our group stronger in the Midwest and we are looking forward to an incredible 2013” stated Series Director Mike Strevel. The Engine Pro Sprints on Dirt Presented by ARP is currently in negotiations to determine 2013 rules, including tires. The 2013 schedule will be released this week and an announcement regarding series sponsorship and rules will be following soon. The Engine Pro Sprints on Dirt Presented by ARP promotes 360 winged sprint car racing in Michigan, Indiana, Ohio and Ontario. The 34th season of exciting Engine Pro Sprints on Dirt Presented by ARP racing will start at the Crystal Motor Speedway on April 27. 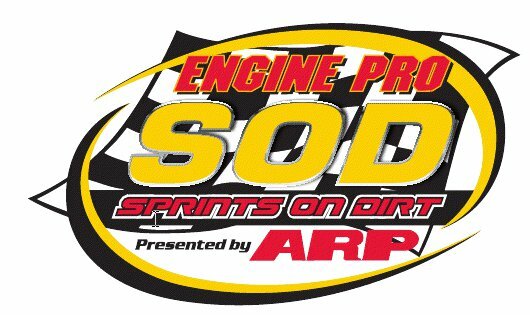 For more information www.sprintsondirt.com is the official website for the series.